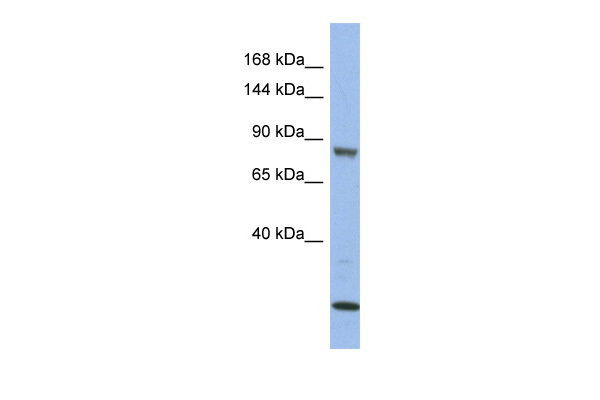 Western blot analysis of MLK3 expression with HeLa cell lysate. Proximity Ligation Analysis (PLA) of protein-protein interactions between CDC42 and MAP3K11 HeLa cells were stained with anti-CDC42 rabbit purified polyclonal 1:1200 and anti-MAP3K11 mouse monoclonal antibody 1:50. Signals were detected by Duolink® 30 Detection Kit 613(red), and nuclei were counterstained with DAPI (blue). Each red dot represents the detection of protein-protein interaction complex. Western Blot analysis of MAP3K11 expression in transfected 293T cell line by MAP3K11 monoclonal antibody (M02), clone 3D11.Lane 1: MAP3K11 transfected lysate(92.7 KDa).Lane 2: Non-transfected lysate. Western blot analysis of MAP3K11 expression in HeLa cell lysate. 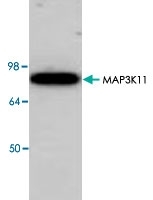 Western blot analysis using MAP3K11 polyclonal antibody ( Cat # PAB14284 ) against recombinant human MAP3K11 expressed in E. coli. 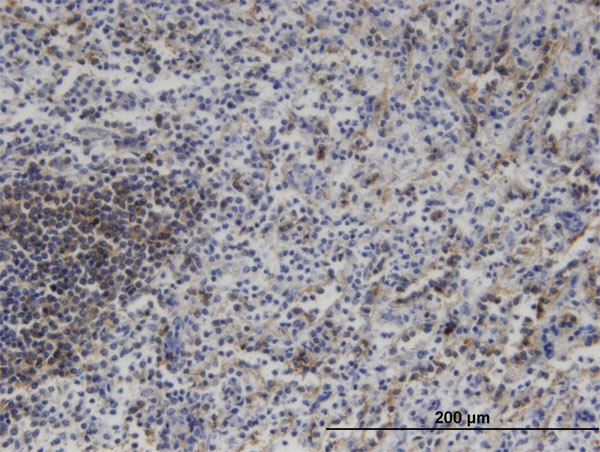 Immunohistochemistry analysis of paraffin-embedded human breast carcinoma tissue, using MLK3 (Ab-674) Antibody. The picture on the right is treated with the synthesized peptide. 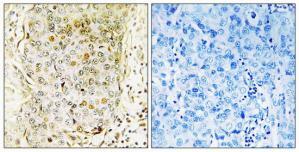 Western blot analysis of MLK3 (pT277/S281) expression in HEK293T (A); NIH3T3 (B); PC12 (C) whole cell lysates. Immunohistochemistry analysis of paraffin-embedded human breast carcinoma tissue using MLK3 antibody.The picture on the right is treated with the synthesized peptide.